Only 4 kilometres away from the famous Gallipoli, is were Alezio is situated. It boasts ancient origins that are buried in the myths of their roots: probably founded by Lizio Idomeneo, mythical King of Crete, or perhaps by the Messapians who called it Alytia in memory of their capital and who included it in the Dodecapoli Messapica (a political military organisation). This can be confirmed by a Necropolis found on Monte d’Elia (6th Century BC). During the Messapian Alezio period, it results as an important centre for both commercial and cultural exchanges with other Messapian cities in the region and with the Greek Taranto, against which however, it was often in battle. After King Pirro's campaigns (3rd Century BC) in Southern Italy and his ephemeral victories over Rome, the City, along with all southern regions, passed under the control of the Romans. Under Republican and Imperial Roman rule, Alezio enjoyed a new impetus, mainly thanks to the construction of Via Traiana, an extension of the old Via Appia (Appian Way), which was constructed between 108 and 110 AD. The fall of the Roman Empire (5th Century AD) brought death and destruction to the South through invasions by the Visigoths, Heruli, Vandals (5th Century AD) and finally by the Goths who settled in Italy until their elimination by the Byzantines in the 5th Century during the Greek-Gothic war (535-553). Alezio however, remained in a state of abandonment and decline after numerous raids by the Saracens who already dominated Sicily. 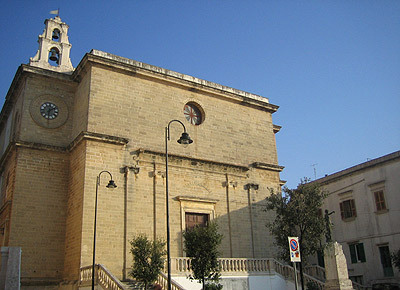 It was only during the 13th and 14th Centuries that the City enjoy a period of repopulation, during which time, the Church of S. Maria della Alizza or Lizza, was built. However, in 1384, Casal d’Alezio was once again abandoned for its neighbour Gallipoli and the territory remained this way until the 18th Century. In 1715, thanks to the munificent work of Gabriele Carlo, Antonio Coppola and Francesco Alemanno, nicknamed "the picciotto," (which has no real meaning), land was granted to some farmers to cultivate and build on. In this way, the fortunate farmers were able to improve the territory which was so generously given to them. The area was developed in a century, both economically and demographically, and became known as Villa Picciotti in honour of one of its benefactors. It kept this name until 1873 when it returned to its original name of Alezio. Today, Alezio is definitely a famous centre for its production of fine DOC white wine, which is drunk in every household in the region, but which also offers two points of particular cultural interest: a visit to the Santa Maria della Lizza Church (12th Century) and that of the Addolorata (19th Century), the City’s Mother Church. Also not to be missed: a visit to Palazzo Tafuri, which hosts the Civic Messapian Museum and where one can enjoy a vast collection of artefacts which will help throw some light on the mysterious and fascinating Messapian civilisation.